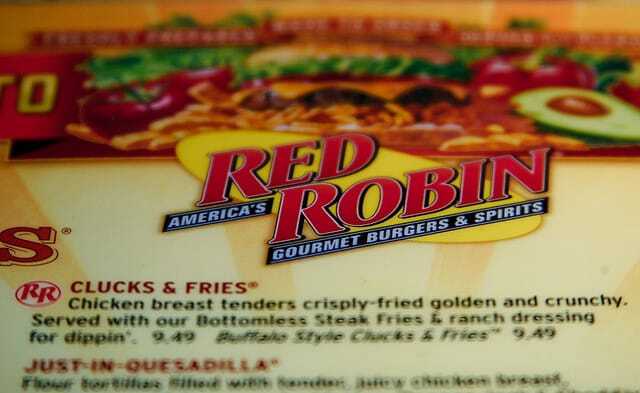 During the next eight years, I waitressed at Red Robin — not necessarily because of what my college professor said, but because I was a stereotypically broke college student and then a victim of the recession. I started as a host managing to-go orders, then bounced around four different locations as a waitress. I opened, I closed, I worked shifts so short it cost me more to drive to work than I made, and I worked 15-hour days that paid my rent for the month. And I became incredibly familiar with how Red Robin’s Point of Sale (POS) system worked — and how customers could use loopholes in the system to save money. Servers use the POS system to enter your order — everything from your glass of water to your entree to each and every soda refill. Knowing its secrets can help you save money on your order, which can add up if you like to visit often or with a group. Ready to learn how to save money at Red Robin? Red Robin’s portions are huge, so it’s easy to share a meal and still feel full. If you and your friend or spouse can agree on the same meal, splitting a meal can save you serious cash. A burger with fries costs around $8, but you can easily make this a decent-sized lunch by asking your server to split it between two plates. The biggest bonus: You’ll each get the same amount of fries as if you ordered your own burger. If you’re still not full, you can always ask for extra fries when you order, or when the server comes by to check on everything within two minutes of the food being dropped off. By splitting a meal, you’ll save the cost of ordering a second burger, around $8. If you combine this strategy with only drinking water, your bill will be under $10 instead of the average $25. Also consider splitting a milkshake. Red Robin offers two options for shakes — a single or a “Monster,” which comes in a malt glass with extra milkshake in a tin. If you ask to to split a Monster shake, you’ll each get a full-size shake in a glass with whip cream and a cherry. The price difference between a single and a Monster is only a few bucks, so you’ll end up saving around $5 by splitting a shake rather than each getting your own. The only downside? You’ll have to agree on the flavor! Not super hungry, but in the mood for one of Red Robin’s huge salads or entrees? Trying to control your portions, or watching your calories? Managing what’s in front of you while eating out can be hard, but it’s a lot easier when the food is out of sight, out of mind. In Red Robin’s POS, the server will enter your food normally, and manually type in something like “half to-go”. This tells the kitchen to make half of your meal as normal, and place the other half in a to-go container, which will be delivered with the food you’re eating at the restaurant. While you might not get much more food this way, by keeping half the meal in a to-go container, you’ll enjoy two meals for the price of one. Red Robin recently revamped their menu to encourage customers to order fries — even though they come for free with burgers. Unless you’re the only one at your table who wants fries, don’t fall for this! Servers work for tips, so most will pick up on this strategy and bring out an extra basket (called a “fry fill”, which is free) when they deliver your food. If they don’t, have your friend or date ask for more fries when the server stops by. This will save you about $3 — not as much some of the other tricks, but enough to add up over time. Technically the kids’ menu is only for those under 12 — but that hasn’t stopped plenty of adults with bite-sized appetites from ordering a comfort bowl of mac and cheese. The kids menu includes options not found on the adult menu, and is much cheaper than what you will find on the regular menu. If you aren’t very hungry and know spending $10 on a meal won’t make much sense, ask for the kids’ menu when you are seated. Of course, there are a few catches with this strategy. Don’t order off the kids’ menu if you’re sitting in the bar. The cocktail waitress likely will impose the “kids-only” rule on you, since she’s working for tips and your $6 tab isn’t helping her at all. While some of the kids’ menu items are bottomless (such as the mac and cheese), don’t take advantage of this if you’re an adult ordering these items. You’ll find bigger portions of similar items on the adult menu if you’re actually that hungry. While managers might not love this strategy, plenty of servers are happy to indulge you on these orders. If you truly just want a smaller portion of chicken strips — and can’t find anyone to split it with you — this trick can save you quite a bit of money. It’s worth a shot before ordering the adult portion and taking half to-go. Red Robin has offered free Birthday Burgers for decades. If you’re a member of their loyalty program, Red Robin Royalty, you can enjoy a free burger anytime during your birthday month. The Royalty program also offers you $20 towards your sixth visit after joining the program, and a free meal every 10th order. To sign up, you just need an email address. To make the most of it, make sure everyone you’re likely to visit Red Robin with joins the program. That way, you’re most likely to knock a few bucks off your bill when it’s someone’s birthday month or one of you has reached a “free item” milestone. These strategies will help you shave a few bucks off your bill each time you visit Red Robin. Just remember to factor in the true cost of your order when you calculate the tip — your server is working just as hard whether your burger is free or not. Your Turn: If you’re a regular at Red Robin, what tips and tricks do you use to save money?